They are difficult fish to care for, despite their being easy to acquire. They grow very large, and easily outgrow even large tanks. As they are fairly active swimmers, they need a lot of open space in their tank. Floating plants seem to reduce this fish s nervousness, as they provide shade. Bright lighting is unnecessary and even harmful, as it will make the fish skittish. 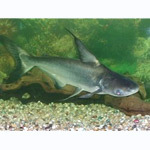 The iridescent shark can be purchased in an albino form and an artificially dyed form. The dyeing process is very harmful to the fish and should not be supported. These fish can be quite nervous are easily spooked, and have very bad eyesight. Not recommended for home aquaria because of the large size they attain. It s omnivorous, but is primarily a meat-eater. In nature adults are known to be particularly fond of whole dog carcasses! Adults are too large to breed in a home aquarium setting. 300cm and up to 300 kg in weight! Although it rarely reaches this size in captivity, it s easily capable of topping 120cm. Iridescent sharks are schooling fish that prefer to be kept in groups of 5 or more.